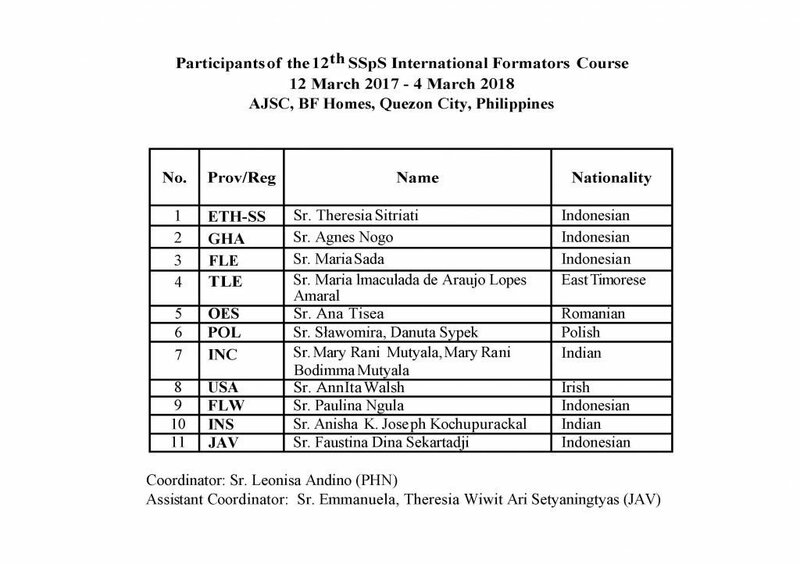 4 March 2018 – Today, the 12th SSpS International Formators Course (SIFC) formally closed. After a year’s journey the 11 participants gratefully and joyfully marked the end– in order to embark deeper and further into the Mission of Formation. Internationally and interculturally enriched the Congregation has much to hope for. The Rosary Province has been enriched with their presence. How the young formands could be doubly blessed! The Celebration was truly eventful. It was COMMUNION of CULTURES and GENERATIONS! An event to remember and to challenge us towards continuing transformation in mission for mission. The presence of Sr. Maria Theresia Hörnemann SSpS, our Congregational Leader, added color to the celebration, besides her two-week stay with the Group, whom she accompanied as they made a holistic synthesis of their one-year journey. The Mass Presider was Fr. Roger Champoux SJ, who accompanied some of the course participants in their weekly growth sessions in the Our Lady of Peace Guidance Center; he was also a resource person in some of their classes during the year. Joining the celebration were Sr. Carmelita Victoria, Philippines-North Provincial Leader, and some other 60 Sisters from the Metro Manila SSpS communities. Sr. Maria Imaculada: I am very grateful for the opportunity to be part of the SIFC 12 program. It was an enriching experience. Sr. Dina: Thank you, Sisters, for your loving support and prayers throughout our journey in the SIFC-12. All the best to SIFC-13! Sr Maria Sada: I am really grateful for the wonderful celebration and the big support from the Sisters in this Province. “Be happy as a formator”, Sr. Maria Theresia said. Sr Ana: I am so grateful for the possibility to have this time of renewal and formation in my religious-missionary life. “The Almighty has done great things for us. Holy is his name!” This statement resounds in our hearts as the time toward the end of one year course was coming. Fr. Roger Champoux SJ said during the homily that the word “passion”, according to dictionary, has 2 meanings: one is being passionate – zeal for something, and the second is as suffering. In Jesus we see them both. He was passionate for God’s kingdom and His passion brought liberation. We are also called to be passionate for God and His mission even if it can also include passion. Now that the course has ended, we are grateful for all the loving support of all the members of the Philippines-North Province, our own Provinces and the whole Congregation. May the blessings we received during the course bring fruits in our common mission. Thank you! A significant experience during the course…. Experiencing the love of a God who is so Divine and Human, just after Christmas, seven participants of the SIFC12 (12th SSpS International Formators Course) along with our Coordinator Sr. Leonisa Andino ventured into one of the most enriching experiences of encountering the ‘Other Face of God’ in the serene and beautiful mountains of Mindoro with the people of Mangyan tribes. The beauty of Mindoro is enchanting with green mountains, crystal clear rivers and river beds filled with multi-coloured pebbles. Walking through these sacred spaces which are not desecrated by human greed truly brought us healing and spiritual nourishment. Every interaction with the people evoked in me the awareness of a loving, welcoming, caring and compassionate God. There are 8 tribes of Mangyans living on the mountains of Mindoro Island, Southwest of the Philippines. They have their own tribal names, dialects and customs. For hundreds of years they lived unnoticed and unknown. Missionaries have begun work among them since the last century, bringing them the light of education and faith in Jesus. 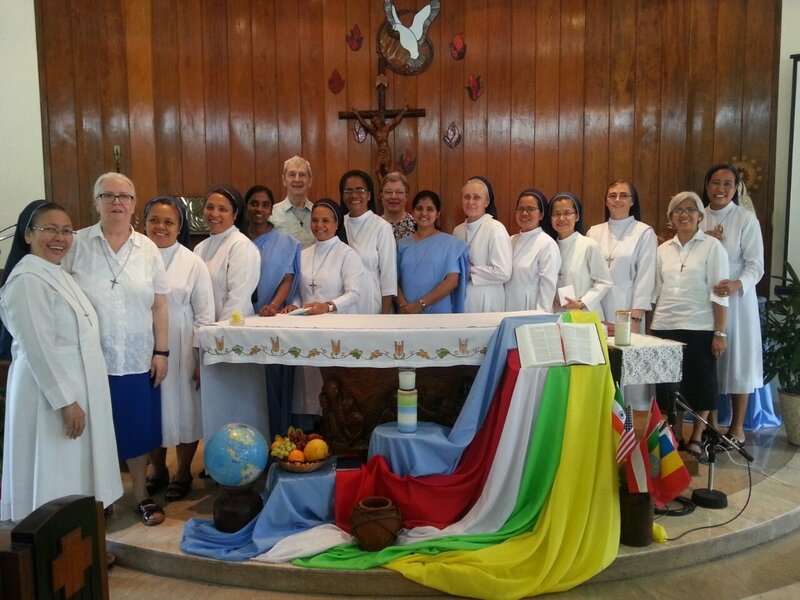 Four of our sisters from the Rosary province are actively involved in the lives of these people through education, pastoral work and health care. After reaching our community in Roxas, which is a town close to the mountains, we were divided into three groups. Srs. Florita, Jovylin and Barbara Panfil (Poland), accompanied each group to the mountain villages. Since it was Christmas season our main objectives were to greet the people in the joy, love and peace of Jesus and to animate prayer services in the villages and give Holy Communion. I was inspired to see that in most of the villages women organised the meetings and led the prayer services. We also conducted some recreational activities for children. Our journey to the villages was quite adventurous. It was tedious as we had to walk for hours through stony and slippery paths, crossing rivers and climbing mountains, with back packs, raincoats and walking sticks. One day we had to cross a river almost 34 times in the pouring rain. We ate boiled bananas and yams. We went to sleep as soon as it was dark as there was no electricity. One night, five of us slept in one small room and there was absolutely no place to move – none of us could change our position! We were totally free from the hush and rush of a city life, and interference of electronic gadgets. We enjoyed every moment we spent together with the people. The whole experience can be summed up with the metaphor of ‘Salvavida’, a Spanish word which means ‘life-saver or life boat’. It is made of tyre tubes. A few times we had to use it to cross deep rivers with strong currents. ‘Each one sat on one and young boys from the mountains would swim through the rushing waters carefully holding it. Undeniably the boys were our life preservers. In all the marvellous experiences we had, all the people we met and all the moments we trod through the magnificent nature, we encountered the ‘Other Face of God’ who is the life-giver and preserver. Rome: Confidence in the youth? Yes!